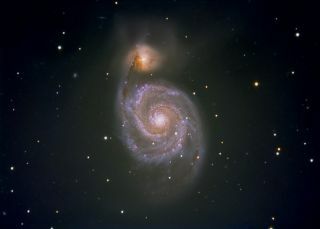 The whirlpool galaxy, also called Messier 51 (M51), is located in the constellation of Canes Venatici. Charles Messier discovered the brighter galaxy NGC 5194 in 1773 and his friend Pierre Mechain found the secondary nebula, NGC 5195, in 1781. The Whirlpool galaxy shines majestically in a dynamic image snapped by a British amateur astronomer in Ham, a small village on the South Coast of England. Skywatcher Ian Sharp photographed Whirlpool galaxy, also called Messier 51 (M51), during a March 2009 observing campaign and recently shared the view with SPACE.com. The Whirlpool galaxy is also famous because Lord Rosse first observed the spiral structure in 1845 using the legendary 72-inch telescope at Birr Castle in Ireland. Recent simulations of the interaction between the two galaxies show how M51's spiral structure was caused by NGC 5195 passing through the main disk of M51 about 500 to 600 million years ago. The galaxies are about 24 million light-years away and contain about 160 billion stars. A light-year is the distance light travels in one year, or about 6 trillion miles (10 trillion kilometers). Sharp used a Vixen VC200L telescope with a 0.67x telecompressor and ATIK 314L camera to get this image. Multiple exposures are made to collect enough light for an image that would otherwise not be evident to the eye. "Living in Ham since 1998 with its superb dark skies, has re-kindled my interest in the last couple of years and I now count myself amongst the ranks of active amateurs again. The changes that have occurred in the last few years with the advent of affordable CCD cameras and web cams have astounded and inspired me into action," Sharp explained on his website. Sharp described how his interest in astronomy began at a young age after spending an afternoon with astronomer Patrick Moore. "One of the defining astronomical moments of my life was a visit I paid to Patrick Moore's house one summer day in 1970, where I was patiently shown around the various telescopes and given encouragement, tea, cake and books by this remarkable man," Sharp wrote. "I returned in the evening to spend several hours being shown wonderful views through the superb 12" Newtonian and the 5" refractor telescopes. My interest in astronomy was cemented forever after that—how could it not be!"